The Dulwich Festival Fair on Goose Green SE22, celebrates its tenth anniversary this year, and is part of Dulwich Festival, of which you can read more about HERE. I’m currently working on some illustration updates for SE Magazines so here is a little variation on the Festival Fair title text for the May editions of the magazines. I'm several weeks behind on posting this (and I had mislaid the picture) but better late than never etc. Simon Hughes MP, and Councilor Ben Johnson showed their impeccable taste at this year’s Bermondsey Street Festival when they stopped off for a chat and browse at my stall. This years event was not dampened by the rather dull weather, after a quiet start it just kept getting busier with the music going on well into the evening. All in all a good day, roll on 2015. I also think one of these SE1 prints would look rather good on a wall at Westminster! Photo courtesy of Bill Brotherton. Every home should have one! - You can now order a customised version of one of my postcode prints and give your home that piece of personalised design it deserves! Highlight your road, add your name, add your address, choose an alternative colour. Available as an A3 or larger size giclée print, printed using non fading inks on soft textured natural white 315gsm fine art paper. Prices start at £50.00. For more information please get in touch. Venturing beyond South East London into the heartland of the most famous tennis competition in the world. Available as an A4, A3 or A2 giclée print, produced using non fading inks on soft textured natural white 315gsm fine art paper. To purchase a copy please get in touch. 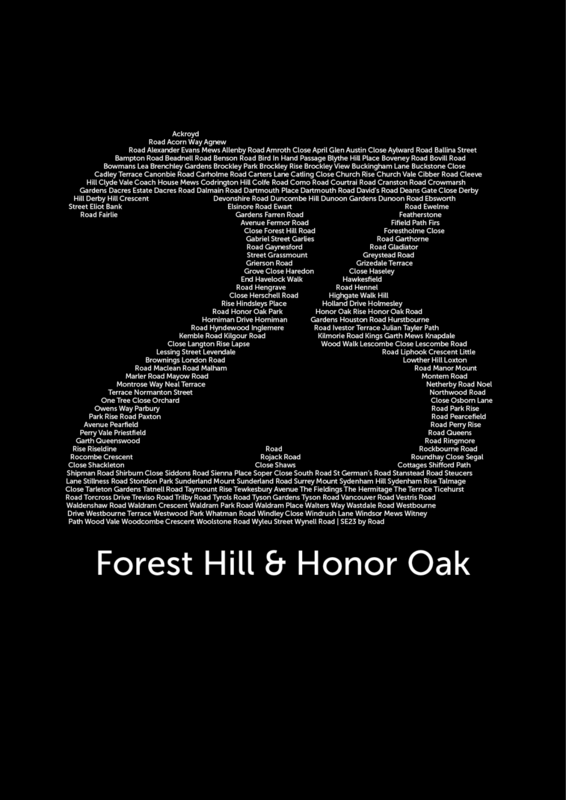 Thanks to Hills & Parkes Deli in Honor Oak Park I have now sold out of the SE23 screen print. Not only do they sell great food but their shop has been the best ad-hoc gallery space in SE23! Many thanks to go to Emma & Jacqui for giving it pride of place in their shop window. If you missed out on this print, live in SE23, and want some locally themed wall art you, can now order the new SE23 design as an A4, A3 or A2 Giclee print, please get in touch if you would like to purchase a print.